Pieštanske Čajky will face Tsmoki Minsk in the Game One of the EWBL quarterfinal series on Wednesday, January 23, at Diplomat arena. Tipoff at 18:00. Pieštanske Čajky haven`t played at the Final Four yet, while Tsmoki Minsk are looking for their first semifinal since 2016. The playoff hopes of the Slovak team were limited after a poor first stage at Brno. Pieštanske Čajky lost two of three games there, including a 56-71 defeat at the hands of Horizont Minsk and a 39-73 loss against Žabiny Brno. Richard Kucsa`s team has improved a lot since then, by posting three victories in four games. 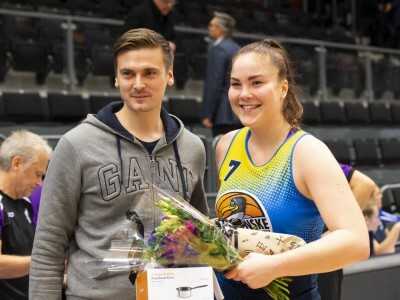 Recently, the Čajky travelled to the High North to inflict a surprise 69-64 win over the Swedish champions Lulea Basket. Horizont faced a different road and crashed out of the competition. Tsmoki Minsk must be proud of their effort and achievements so far. They joined the teams like TTT Rīga (2016, 2018, 2019) and Good Angels Košice (2018) to finish the regular season with a perfect record 7-0. The Dragons posted average winning margin of 12,8. Their hit list includes two home wins over A3 Basket (75-60) and Olimpia Grodno (79-59) as well as a 67-66 road success over Rostov Don SFEDU at Ostrava, Czech Republic. The Čajky have a 12-3 record at Slovak Extraliga. They lost in their first home game against Young Angels Košice (69-73) on September 29 but won the next two contests on the road (78-75 and 68-55). The other two losses came at the hands of the former EuroLeague Women champions MBK Ružomberok (57-59 at home and 64-87 on the road). Pieštany sits in the second place. The Dragons have a 13-0 win and loss record at Belarus championship. The most difficult game so far? A 72-68 win at Horizont Minsk on December 20, 2018. The second game is scheduled on January 27. The four best teams will play another two rounds of matches (six games for each team), starting from February 3. Viktoryia Hasper is the fifth best scorer (averages 16,4 points) and the second best rebounder (9.4 rebounds) in the competition. Minsk center has the second best efficiency rating of 20,3 in just 24:16 minutes of play. Danielle McCray (University of Kansas 2006-2010) is also one of the core players for the Dragons. Versatile forward averages 14,7 points and 5,7 rebounds per contest. She is also a great defender. Rachel Elise Theriot (Nebraska) has 9,8 points and 4,5 assists per game. Six Pieštany players have scored 6,6 or more points per game, including Janee Thompson (11.4), Jessica Lubin (9.6), Martina Matejcikova (9.0), Dominika Deptova (8.0), Ivana Jakubcova (7.1) and Rebeka Mikulasikova (7.1). Tsmoki and Čajky are the two least scoring teams in the Top 8, averaging 73 and 60 points respectively.